It's not a secret that I love Barry M nail varnish, it's a great brand with tons of different colours and types of nail paints. I would say that about 70% of my nail varnishes are Barry M. I had heard about the Barry M Confetti Nail Paint but had yet to try it out, so I decided to guy and buy one shade to judge if it was any good. I choose the black and white shade, as I thought that I would use the Confetti Nail Paint as a top coat to my Rimmel 60 seconds nail varnish. It turned out amazing and I love it. It is awesome and gives an effect to your nails without having to try and draw it on yourself. You can also just use the Confetti nail paint on it's own but I thought it looked better as a top coat. 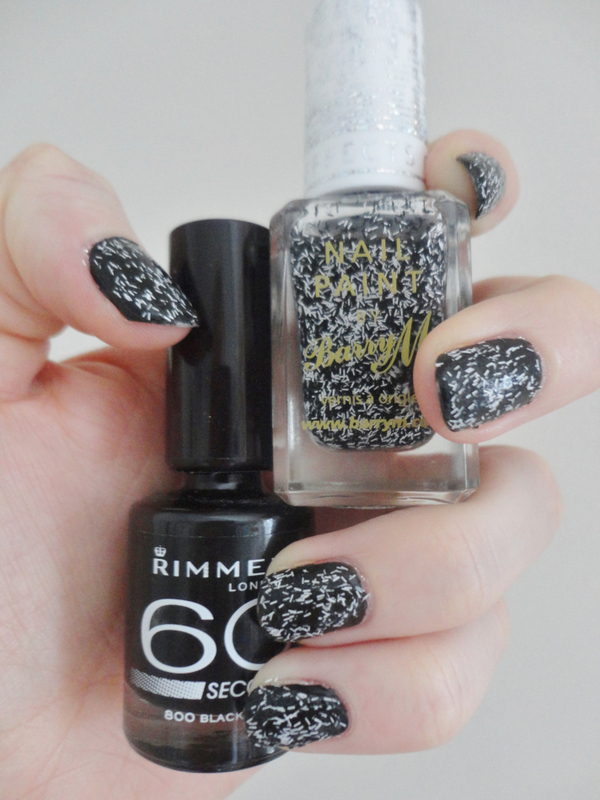 I applied two layers of Rimmel black nail varnish and then two layers of Barry M Confetti nail paint (Liquorice shade). Barry M Confetti Nail Paint comes in 5 different shades: Dolly Mixture (gold), Liquorice (black and white), Marshmallow (light coral colour/pink), Bubble-gum (blue) and Sour Apple (green).